Plastic resin codes identify the type of plastic used in manufacture so that it can be sorted and recycled. This guide explains the applications and characteristics of the most common types of plastics. Polyethylene Terephthalate or PET is the most commonly used plastic in the world. In its resin form it’s used to make bottles and containers for food and drink - most soft drinks are bottled in PET plastic. The same polymer when used for fabrics is known as polyester - a material used in clothes, textiles and carpets. PET is strong, lightweight, hygienic and shatterproof making it ideal for packaging food and drink. PET is easily recyclable and can also be made with recycled content. High Density Polyethylene is extremely strong and durable so is used to produce corrosion resistant piping, building materials and packaging for thick, heavy liquids such as shampoo, bleach and other cleaning products. As the name suggests, this plastic is dense which makes it stronger and harder than plastics of a similar weight, which makes it ideal for use in bottle tops and caps. HDPE is durable, strong and can be used with corrosive materials such as bleach. HDPE is easily recyclable and can also be made with recycled content. Polyvinyl Chloride can be made in two ways: rigid and flexible. Flexible PVC is used to make bottles, packaging and medical devices such as blood bags and softer forms are used as flooring, in cabling, clothing, insulation and inflatable products. Rigid PVC most commonly used in construction and plumbing as pipes, doors and windows. PVC in both rigid and flexible forms has high tensile strength, is durable, long lasting and robust. PVC can be recycled to make new PVC products; PVC flooring is one of the most successful areas of recycled content PVC production. Low Density Polyethylene is used to make carrier bags, bin liners, packaging films and other flexible items such as foams, squeezy bottles and toys. LDPE is often used in packaging, for instance the rings that hold together multipacks of bottles and as a liner for laminated bottles such as card juice containers. LDPE is flexible, strong and can be used in corrosive environments. Rigid LDPE can be collected and recycled by curbside programs however flexible products are difficult to recycle and are often contaminated by the item they are packaging. Polypropylene is the second most commonly produced plastic, its versatility enabling it to be used in a huge range of applications. A semi-rigid plastic, it is ideal to use on items such as hinges and flip top caps. PP is commonly used for packaging food and non-food items, as well as reusable food containers, housewares, ropes, carpets, car parts and laboratory equipment. PP is colourfast, heat resistant, fatigue resistant and highly resistant to corrosion and chemical leaching. PP is easily recyclable and can be recycled in a closed loop four times before the process has a negative impact on the polymer. Polystyrene is most commonly known in its expanded form, used as protective packaging materials. It is also used in its rigid form to make food packaging such as yoghurt pots and disposable crockery, cd cases, petri dishes and disposable razors. PS is not usually recycled in the UK, although some councils accept it at household waste recycling centres. 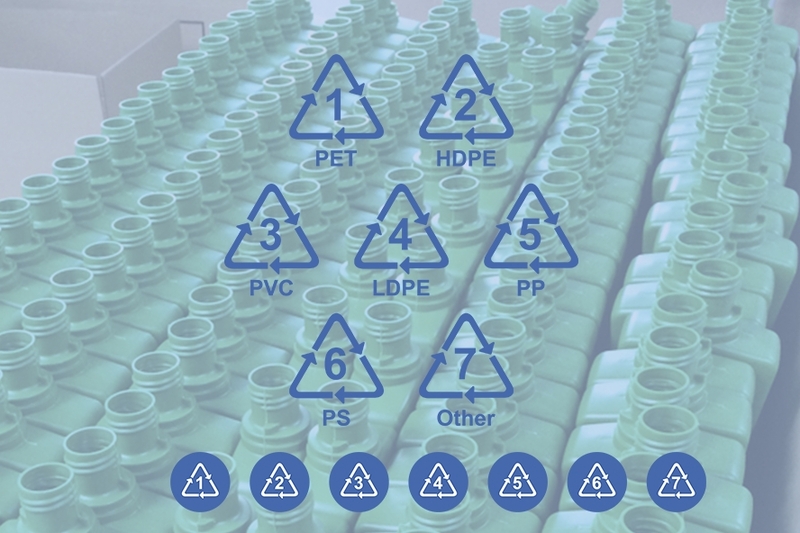 Seven is used to class all other types of plastics that do not fall into any of the other 6 categories. This includes acrylic, nylon, polycarbonate, bioplastics and plastic combinations.